Thousands of people in the region will bike to work Thursday. There will be more than 100 pit stops set up throughout the region to accommodate registered Bike to Work Day participants. 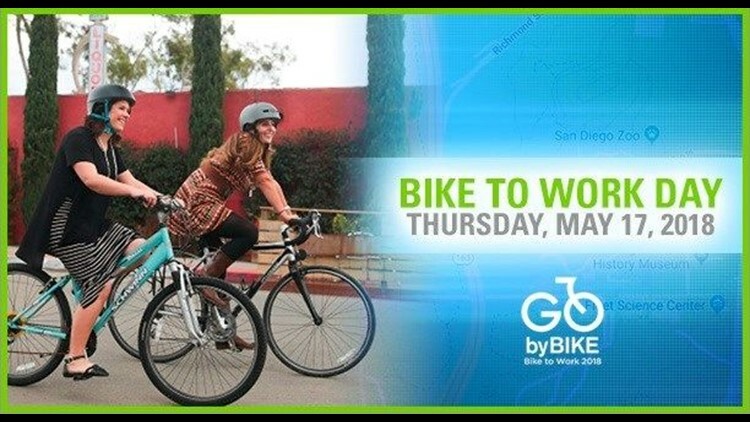 SAN DIEGO (NEWS 8) - Thousands of bike riders throughout the San Diego region hit the streets Thursday for Bike to Work Day. SANDAG has organized Bike to Work Day for more than 20 years. Registered Bike to Work Day participants were greeted by volunteers at 100 pit stops in the region, where they received a free t-shirt, refreshments, snacks, and encouragement. Various stops offered extra incentives such as free bike repairs, bike tune-ups, and breakfast. A Ride Home Rally will be held at San Diego Concourse at 3:30 p.m., where cyclists will find everything they need to recharge and make their way back home. Qualcomm: 5717 Pacific Center Blvd., located at the northwest corner of Lusk Boulevard and Pacific Center Boulevard, Sorrento Valley. San Diego Zoo and City of San Diego – Therapeutic Recreation Services: In the parking lot by the Balboa Park Carousel, just off Zoo Place and Park Boulevard. SportRx: 5076 Santa Fe Street, Suite A, San Diego. City of Carlsbad: Located at Frazee Beach, at the intersection of Carlsbad Boulevard and Pine Avenue, Carlsbad. City of Vista, Haro Bike & Alpha Bike: 200 Civic Center Dr., Vista, in the parking lot at the southeast corner of Civic Center Drive and Alta Vista Drive, Vista. Grossmont College: Grossmont College Drive, El Cajon, on the corner of the existing bike path near the southbound State Route 125 on-ramp, just outside of campus. View SANDAG iCommute pit stop map for regional pit stop locations.